'Let yourself be silently drawn by the strange pull of what you really love. 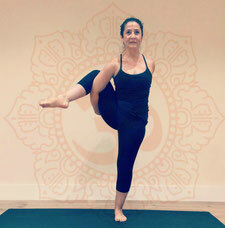 Carla is a 500hrs plus, Advanced Accredited Yoga Teacher and registered with Yoga Alliance Professionals UK. Her practice is in the lineage of Krishnamacharya, rooted in Ashtanga; incorporating Buddhist / Taoist philosophies. With her love of travel and exploring new destinations; she started practicing Yoga well over a decade ago whilst working in the Travel Industry and company Performance / Learning & Development Coach. Like many of us she's experienced being in pressured, demanding work environments where she found a regular Yoga practice the perfect antidote, whilst it also awakened and continues to deliver much more! Practicing and studying different forms of Yoga has enabled her to develop her teaching style, drawing from Ashtanga Vinyasa, Vinyasa Flow, Jivamukti, Iyengar . 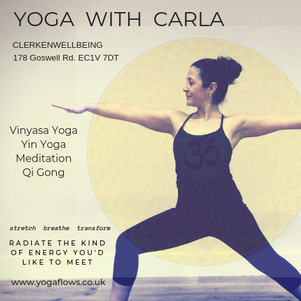 Carla teaches the importance of a balanced and rounded practice, also teaching more restorative forms; Yin Yoga, Yoga Nidra and Mindfulness Meditation; as well as incorporating Qi Gong / Tai Chi inspired Yoga Flows. Teaching from her practice, that our Yoga isn't all about who can get into the most 'perfect pose' or 'forcing' ourselves into positions, whether it be' on or off' the mat! It's about extending and expanding, creating 'stillness & space' in our bodies & mind, ~ Space brings Freedom! ~ (B.K.S Iyengar). Her regular Yoga classes start 'peeling away' the layers of toxins and blockages we all carry and store, which create stiffness and tension physically and mentally, holding us back. This 'peeling away', develops a better communication with our body, mind and soul, enabling us to make more appropriate choices in how we choose to live our lives and with the world around us; whilst reconnecting us back to a 'True contentment' & to our 'True Self'! Her main reason for teaching yoga is enabling 'space' for people to ‘tune into’, awaken and access our own full Potential, allowing for transformation into the person we wish to be and Truly are! Insight Yoga - Sarah Powers, WithYinYoga -Sebastian & Murielle, Yinspiration Yoga - Jo Phee, The Yoga People, Yoga Nidra Network / Uma Dinsmore Tuli, iRest - Yoga Nidra - James Reeves). She pays great respect to 'all' her teachers both past and present; and continues to listen, learn and share from all those on the path of Yoga.